Preheat oven to 350 degrees. Lightly grease a 9″x13″ baking pan. Mix flour, salt and baking soda together in a large bowl. Add brown sugar, oats, cinnamon, nutmeg and ground cloves. Cut in butter or margarine with a pastry blender or 2 knives until mixture is crumbly. Spread half of the crumb mixture in the baking pan. Top with apple slices and raisins and sprinkle with sugar. 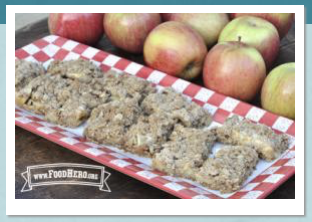 Spread remaining crumb mixture evenly over apples. Bake at 350 degrees for 40-50 minutes. Cool and cut into 12 bars.